9:15AM. Day #2. 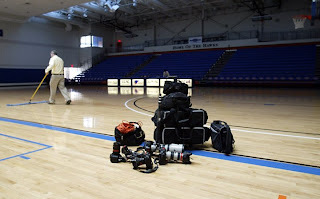 Arriving at SUNY New Paltz for the second full day of four Section 9 Championship basketball games in New Paltz, NY on Sunday, March 8, 2009. Some of the gear I carted in included about 200′ of orange extension cord, a few remaining feet of black gaffer’s tape (I’m now out) and even the cheap Home-Depot gray crappy tape, too many lenses to remember, two Bogen-Manfrotto Magic Arms, 5 Super-Clamps, about a dozen Pocket-Wizards, a bunch of extra AA batteries for the PW’s, one very large ladder provided at the college on Saturday morning, plenty of fresh chewing gum, and oh yea, a few packets of Tylenol Extra-Strength caplets I picked up with my mandatory ham & egg on a roll early Sunday morning on the way to college venue #2. I will post a slideshow of some of the best images from the weekend here in a bit. Stay tuned… -cg. This entry was posted on Monday, March 9th, 2009 at 5:43 PM. 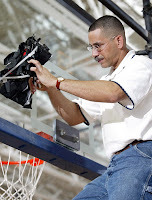 It is filed under Uncategorized and tagged with basketball, location lighting, remote, sports, strobe. You can follow any responses to this entry through the RSS 2.0 feed.